Proud of its distinctive culture, the Basque Country is known to its local population as Euskadi or Euskal Herria, "Land of Basque Speakers." Widely regarded as one of the world’s best destinations for gastronomic itineraries, this region includes several major culinary centers, not the least of which is San Sebastián, known for its singular tapas or "pintxos," as the locals call them. The region’s big cities boast not only award-winning restaurants, but also numerous galleries, museums, and historical attractions. Beyond these urban centers, Basque culture thrives in villages dotting the rolling foothills of the Pyrenees Mountains, which are home to a multitude of world-class wineries and innovative cider cellars. Basque Country is in Spain. 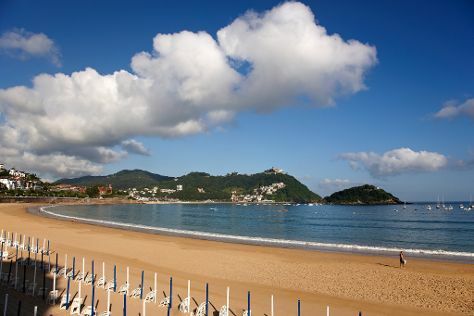 Put Basque Country at the heart of your travel plans by using our Spain itinerary maker tool .